This afternoon as I was mowing I noticed something in my shoe. It was in the final 10 minutes of mowing and felt like a massive wood chip under the arch of my left foot. It wasn’t exactly painful, just annoying giving a constant reminder of it’s presence. My initial thought was to just keep mowing. I didn’t want to deal with it right then. I just wanted to get the mowing done. However, after a few rounds it got more annoying and started to hurt. 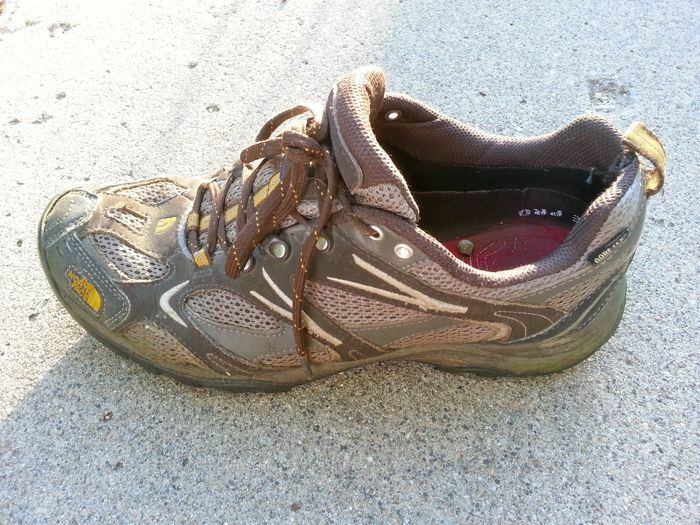 So I stopped the mower, sat down in the ditch, and removed my shoe to find the source of the discomfort. What I thought was a big wood chip was actually one small pebble! I couldn’t believe it. A small pebble! My thoughts as I finished mowing were spent on that pebble. It got me thinking about how that pebble is like a lot of problems. Sometimes problems that seem big really aren’t. You’ll never know how big your problems are until you tackle them head on. It’s better to deal with problems right away instead of letting them linger. Ignoring problems won’t make them go away. 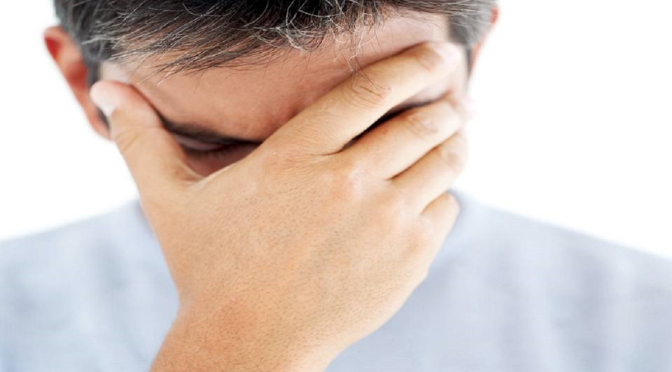 Ignoring problems might make them worse. I love it when the simplest things teach me valuable lessons! Guest posts by my daughters have been some of the most popular here. Today my oldest shares her thoughts on a recent project she worked on! Are you looking to add a pop of color to your bedroom? I was, so I got on Pinterest and discovered melted crayon art. 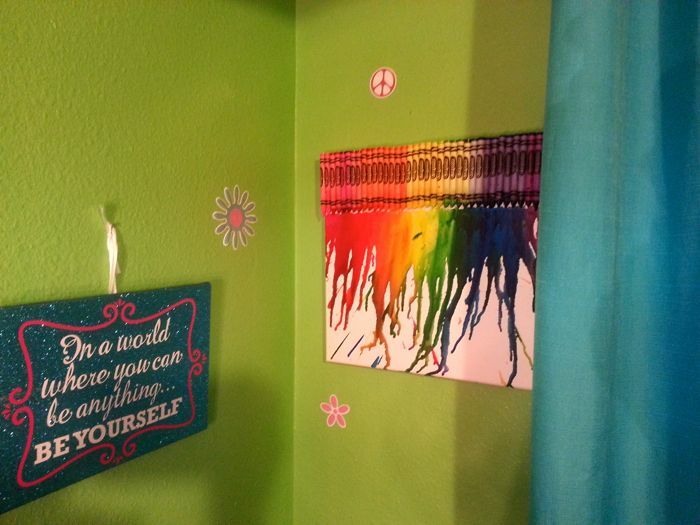 Melted crayon art is a super cheap and super easy project! Right now is the perfect time to get your crayons because you can get them for great back-to-school prices. I got mine for 50 cents a package. Also, watch your craft store ads. Michael’s was running a sale and I got 2 canvases for 5 dollars. 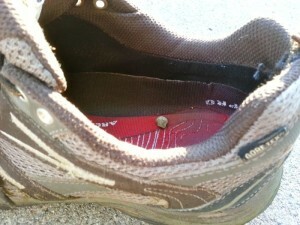 For glue I recommend using E-6000. It’s what I use to glue rhinestones on my dance costumes. School glue works fine too but do not use hot glue, otherwise you will have a BIG mess later on. 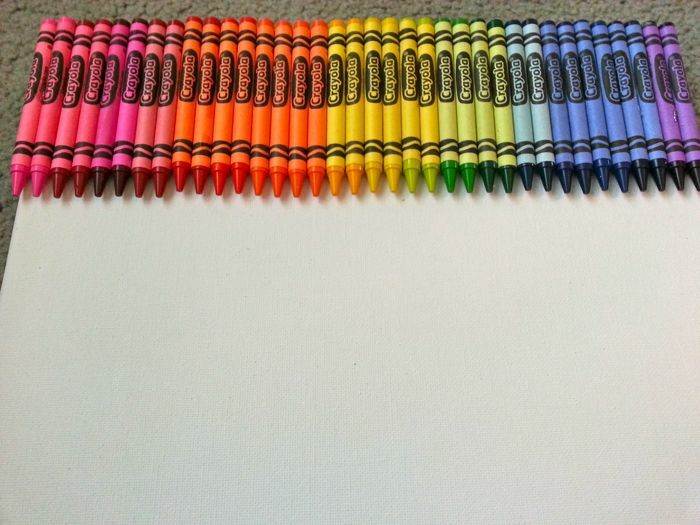 After you get all of your supplies get your crayons, canvas, and glue out. 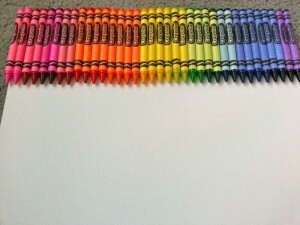 Then glue the crayons on the canvas in groups of 2 by color in the order of the rainbow. Reds, pinks, greens, blues, yellows, oranges, and purples! I didn’t use the grays, blacks, browns, peaches, and indigos. Once they are all glued on let it dry for about 30 minutes. While it is drying set up your space to melt it. Tape down newspaper on walls and floors because it will splatter. After 30 minutes is up bring your canvas into your taped off area. Put your hair dryer on the hottest setting and move it back and forth across the crayons. 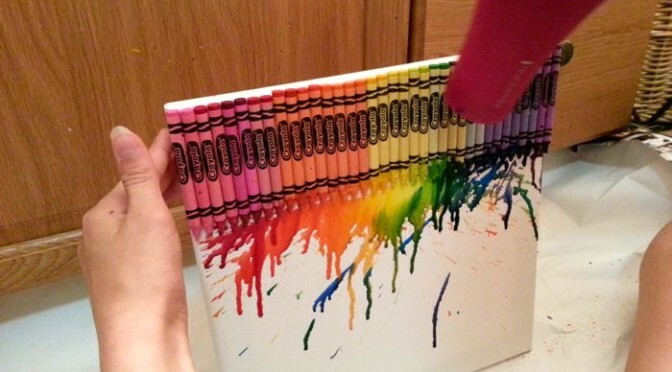 If you hold it at a diagonal pointing down it will splatter wax and eventually melt it to the bottom of the canvas. Repeat that motion until you are satisfied with the canvas. 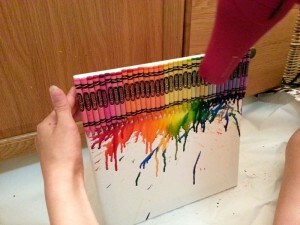 Then let it dry a few minutes and you are ready to hang it up. 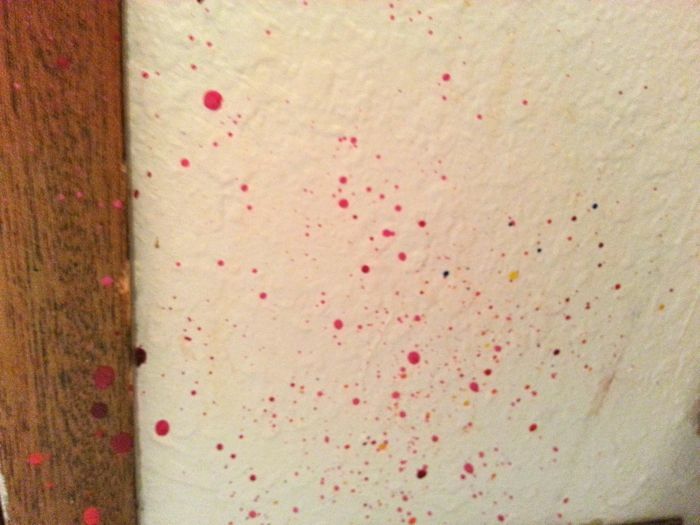 If you have the option I’d recommend doing it outside because the crayon wax will splatter. 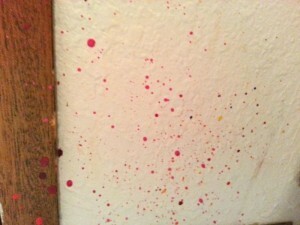 I got some on the wall and bathroom cabinet. It did clean up easily by reheating with the hair dryer and wiping with a paper towel. The last bit came off with a Magic Eraser. 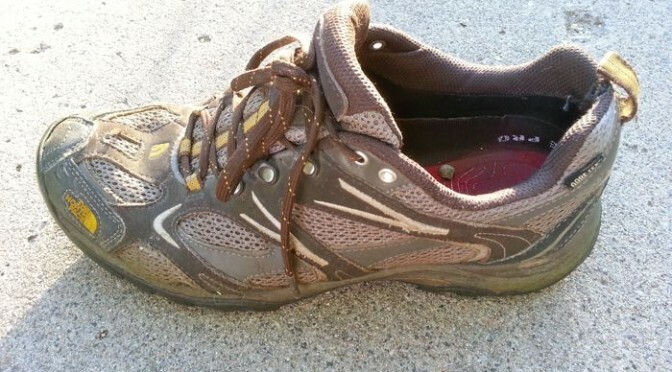 This easy project only a few bucks and about an hour to do. Give it a try and let me know what you think in the comments. Not everyone likes me! There I said it. It wasn’t easy for a self diagnosed people pleaser like me to admit… but I’ve finally come to peace with it. Until recently if I felt like someone didn’t like me I’d fret about it. I’d try and figure out what I did wrong. I’d go out of my way to attempt to change their mind. Which in most cases would backfire and made me feel like they disliked me even more. Now, if I get the sense someone doesn’t like me, I won’t push the issue. There could be many reasons for not liking me. Maybe I remind them of someone else they don’t like. Maybe I wronged them in the past and don’t realize it…or maybe our personalities clash. It really doesn’t matter. I now realize they have the right to feel the way they want. I also have the right to not worry about it and move on. I’ll still treat them with kindness but I won’t let it get to me. I wish I would have realized this a lot sooner in life. It would have saved me from a lot of headaches and worry. How do you deal with someone who doesn’t like you?